The most amazing thing with new generation technology is its intelligence. Now, doors open on their own with the press of a button and handicapped people don’t have to torment themselves every time they want to go from one room to the next. Your handicap door opener will do that for you! They are operated with a button on the wall or a clicker, which can be attached to the scooter or wheelchair. We are aces in the service of these operators and every part of the system. Our Toronto Handicap Door Operators services are immediate, aim straight at the problem and also include their installation. 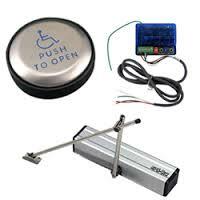 Handicap automatic door openers have a great design, don’t occupy too much space and can be installed in any door. We are masters in their installation taking into account the specifications given by the manufacturer and all safety requirements. We make sure the door opens at your command and closes well. Our maintenance includes similar steps since each part of the automatic operator is checked thoroughly and we make sure of the efficient operation of the safety features as well. FC Locksmith gives great attention to such things since the safety of the client is the priority of all technicians at our company. When problems arise, we are here to solve them. 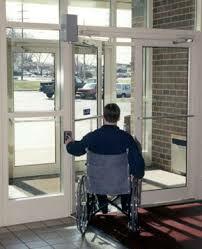 We fix Handicap Door Operators in Toronto as soon as we can and efficaciously. If the door doesn’t close well or the opener is too noisy, you just have to report the problem to our company and let our technicians take over. Our response during emergencies is fast and our repair services are exceptional and take place at once. We are familiar with all types of door operators for either home or commercial use and our services are equally great every single time.